Colors vary from yellow, to crimson, to plum, to green. 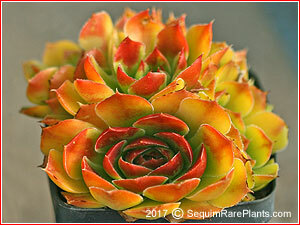 This drought-tolerant succulent requires soil that drains well and a location with a fair amount of light. Long lived, surviving both summer's heat and winter's cold. 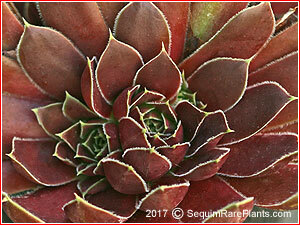 Popularly known as hens-and-chicks, which is also the popular name for Sempervivums, this grows as a tightly clustered group, connected at the roots, and doesn't spread by runners. Cold hardy, -20° to -30°F (USDA zone 4). $6.95 The colors of 'Blaze' change during the seasons, sometimes being a bright red and at other times being a dark maroon/brown. $6.95 As with several other jovibarbas on this list, small short stiff hairs line the edges of the leaves. From a distance this edging appears as an elegantly thin line, contrasting to the leaf color.The leaves are a rich bronze-purple overlaying green. $9.95 The photo was taken on March 1st, and is golden. At other times 'Gold Bug' will be green with reddish tips. 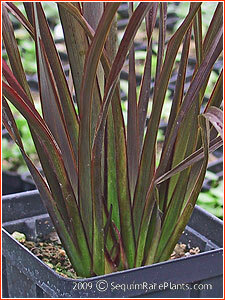 $6.95 The leaves are mostly a rich, medium red, being a lighter red closer to the center of the plant and a darker red towards the leaf tips. 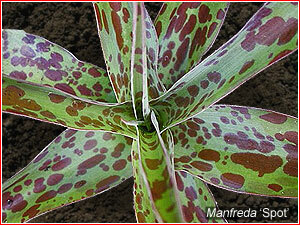 The leaf edges standout with a lighter coloring, due to the small hairs lining the edges. $9.95 With colors similar to another Jovibarba we offer, 'Lemon Sky' shows the most beautiful lemony colors in spring. At other times, the rosettes are more green, depending on the amount of sun they are receiving and how rich their soil is. $6.95 At times the leaf colors are darker violet-red and green, and at other times become a glowing bright red. A combination of influences cause these color changes, such as the season of the year and how much light they receive. 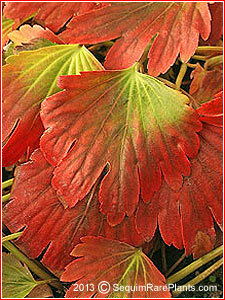 $6.95 For part of the year the leaves are green with darker leaf tips, and at other times their coloring is a vivid red. $6.95 The green leaves are tipped in a blood red. At other times of the year the leaves are more golden or yellowish. 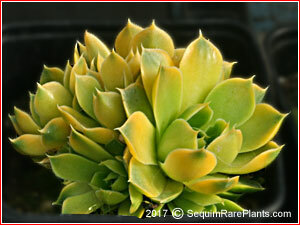 $7.95 This succulent is a bright yellow, especially when grown in bright light and during springtime -- at times it is more of a chartreuse green, still a lovely color to contrast with the other succulents. 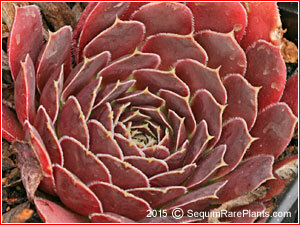 A group of the round, leafy rosettes are usually tightly clustered together, more tightly than you might expect -- and they generally do not produce long runners as Sempervivums do. 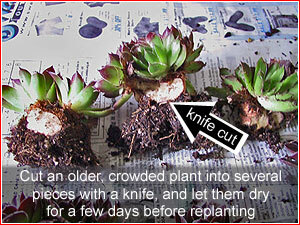 So instead of simply pulling them apart as with other succulents you must cut them with a knife, as has been done with the plant in the picture. And it is important to let the freshly cut tissue air-dry for several days before replanting. $14.95 The flowers are a pastel light green at the top and creamy white below. With age all of the florets become a delicate, creamy yellow. Produced from divisions, not from seeds, so they will all match. Blooming during the later half of summer with flower stems of 3 to 3½ feet high. Cold hardy to USDA zone 7, and zone 6 with winter protection. $11.95 Flowering in July, this softly colored orange/apricot and creamy yellow flower reaches a height of two and a half feet. The soft and rich colors of 'Apricot Soufflé' mix beautifully with lavender, blue and white flowers. $10.95 It flowers in midsummer. 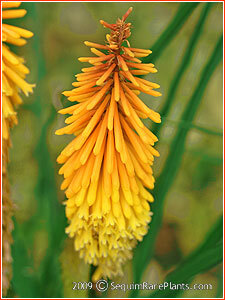 The flowerheads are shaded a yellow to subtle orange. Reaches a height of three feet. USDA zones 6 (with winter protection) to 10. $10.95 Blooms in early summer in a pastel shade of creamy tan that is shaded darker above. 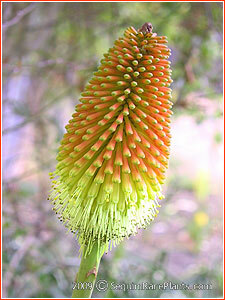 The flower stems are three to four feet tall. It blooms again at summer's end with a change of color to a light greenish yellow. $10.95 A long-flowering plant in an amber-yellow color, it's flowers only reach to two feet, and show in July and August. Cold hardy to USDA zone 6. $12.95 Lemon yellow flowers on three to four-foot stems in June with more flowers appearing towards fall. USDA zones 6 - 10. 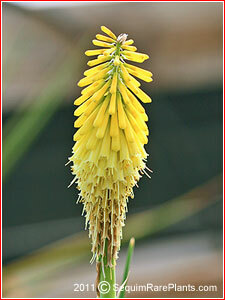 $14.95 Kniphofia caulescens is native to higher elevations in southern Africa and survives a fair degree of winter chill. 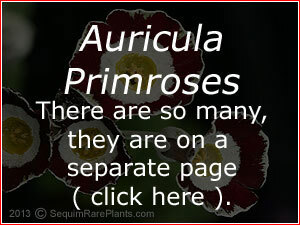 Several online websites claim it to be hardy to USDA Zone 5. In just the right location it may, however Zone 6 is a safer bet. Be sure to plant it where the soil drains well. 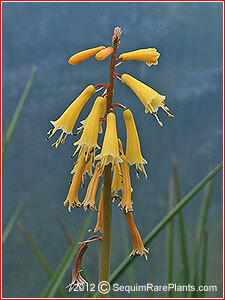 Its species name, caulescens, refers to the stems branching above ground. Its mature height will be 18 to 24 inches, with flowers 24 inches above that. 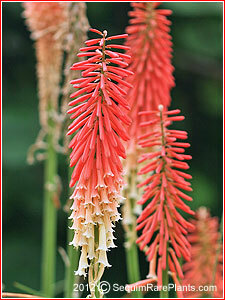 The flowers are a coral-red above and a creamy light yellow below. For us they bloom in late summer. In warmer places they bloom from mid to late summer. The leaves tend to be evergreen, even though freezing weather will burn back the leaf tips. The leaves are a striking bluish, glaucous green. USDA zones 6 - 8 in the East, to zone 10 in the West. 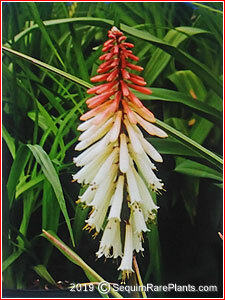 12.95 Tall at 3 to 4 feet, these flower colors are a light orange above and turning to a creamy white as they open, below. Hardy to USDA zones 6 - 9. Some gardeners will find that it survives to zone 5. On the West Coast it grows well to zone 10. Its season is late summer into early autumn. $39.95 The proprietor of Seedhunt, Ginny Hunt, graciously provided several plants of 'Cool Knip' to us a few years back, a plant that she selected and named. 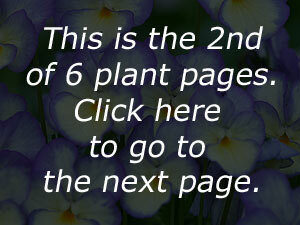 Click here to visit Seedhunt's website, offering seeds of California wildflowers by mail-order. 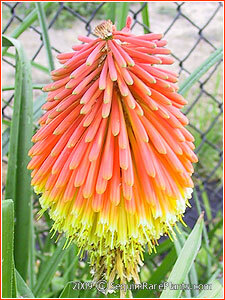 'Cool Knip' is similar in coloring to the torch lily named 'Ice Queen' though growing larger and taller. Mature height of 4 to 5+ feet. 'Cool Knip's' flowering season is the later half of summer to early autumn. We have only a few plants to offer, and limiting it to one per customer, please. 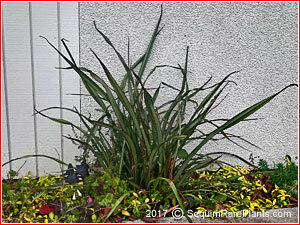 This plant survives well to USDA zone 6, as reported by Ellen Hornig of the former Seneca Hill Perennials. 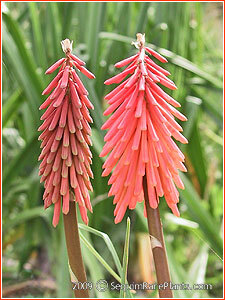 $10.95 Blooming in early summer, the coral colored flowerheads reach a height of three to four feet. Very robust and surviving a greater degree of cold, to USDA zone 5. $8.95 Bi-colored in an orange-red and creamy yellow. 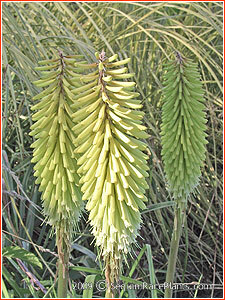 The flowers open in June and July, on two and a half to three foot stems. 'Corallina' grows strongly. USDA zones 6 - 10, possibly to zone 5 with protection over winter. 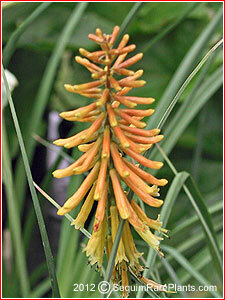 $10.95 Orange-golden flowers that are darker at the top of the flowerhead and lighter on older, lower flowers. The flowers are on 3-foot stems from the middle of summer through August. Our local birdlife loves to visit these flowers and drink nectar from them. USDA zones 6 - 9, and to zone 10 in the West. $10.95 Flowers of a solid coral red in summer on stems of two to three feet. It often reblooms in the fall. The photograph shows two spikes of 'Glow' - the one on the left is younger while the one on the right is older. To help this settle into a new home, winter protection is recommended for its first winter. 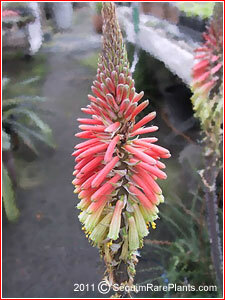 Another name for this is 'Coral Glow.' USDA zones 6 - 10. $24.95 In July and August come these golden flowers saturated in a cinnamon amber, in a warmly burnished, sunny hue. Their height is two and half feet to three and a half feet. USDA zones 6 - 9, and to zone 10 in the West. 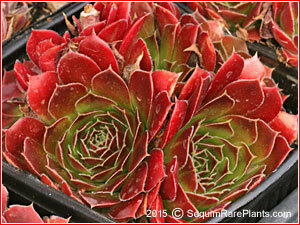 Our plants are propagated by dividing them to ensure they have this color. Limited quantity. $14.95 This famous plant flowers towards the end of summer with a height of three to four feet, in a color of lime green. Americans have read about it in British gardening magazines for years and have only recently been able to find it on our side of the pond. USDA zones 6 - 10. $19.95 The large white torches are lime green when first opening, on stems of three feet, showing for us in late summer into fall. It may flower earlier in the summer for you because many of the late-summer torchlilies will often flower earlier where summers are warm. Although large sized, it grows more slowly than others. In late summer and fall when there are so many warm colors, this cool white and lime is arresting. With this torchlily, its flower stems may grow taller than three feet the first year or two after planting, especially if you plant it in rich soil. 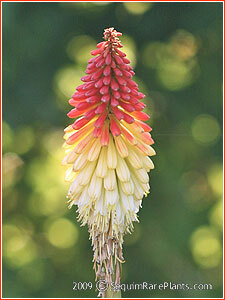 After a plant becomes well established in a year or two, its flower stems will settle into a height of three feet. USDA zones 6 - 10. $10.95 Flowering in July and August, its colors are a pure lemon yellow. It is extraordinarily strong growing. USDA zones 6 - 10, and zone 5 with protection over winter. $12.95 The color of this flower is a very light, creamy yellow with the oldest, lowest florets lightening more. It is a color that does not clash with whatever other flower colors you might have nearby. The flowerheads reach to only one and a half feet or so, beginning in early summer. It is important to not let the soil for this dry out completely. It can be truly ever-blooming from June to September when watered regularly. USDA zones 6 - 9. 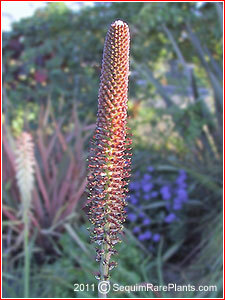 $14.95 The height of this flower spike is in a range of three to four feet. 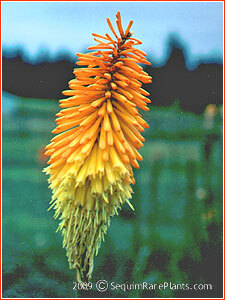 At first the flowers are an orange-tangerine that open to yellow, with a medium size to the head of flowers. The season of bloom is late in summer, to early fall. The leaves are wider than most with a long length, and will take up quite a bit of ground space. USDA zones 7 - 10. 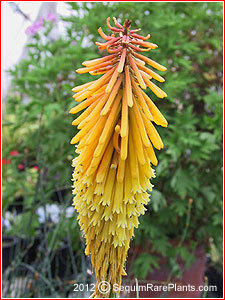 $12.95 Only two feet tall is this torch lily. 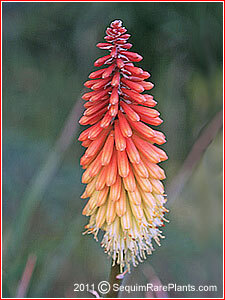 Her flowers are a coral red, showing at the end of summer and on into fall. USDA zones 6 - 9, and to zone 10 in the West. 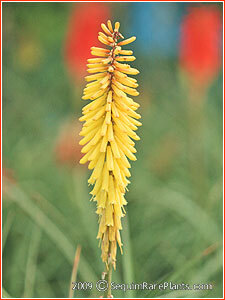 $12.95 'Parkdale' is a lower growing torch lily that blooms early in the season. Its color is mostly a cream, that darkens towards the tip top. Height is eighteen inches. It is named for a small community near Hood River in Oregon, USA. USDA zones 6 - 8, and to zone 9 in the West. Limited quantity. $17.95 We purchased this variety from the mail-order nursery, Holbrook Farm and Nursery, in Fletcher, North Carolina almost twenty years ago. The nursery was well respected in its day, and you may remember it if you bought any mail-order perennials in the 1980's or early 90's. To quote Allen Bush's 1993 catalog, torch lilies always create an impression. They are hard to overlook. 'Parmentier' was planted in the garden and by its second summer it had easily earned a high place on the Holbrook Hit Parade of Plants roster by virtue of the curiosity it generated among garden visitors. 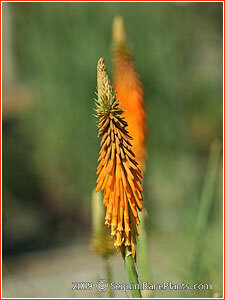 The clumps of grassy foliage remain carefree but unassuming until summer, when reddish-orange spikes or pokers emerge, as they will continue to do for two months if fastidious deadheading is undertaken. USDA zones 5 - 8, to zone 10 in the West. $9.95 Small, dainty flowerheads make this a surprise. The flower season is late spring to early summer, with rebloom possible in late summer. It is not tall, at eighteen inches. USDA zones 7 - 9, and to zone 10 in the West. $11.95 The large, long heads of flowers are in lime green and the palest of yellows, and are much anticipated here in late summer. This is very vigorous. The height of the flower stems is three to four feet. USDA zones 6 - 9, and to zone 10 in the West. 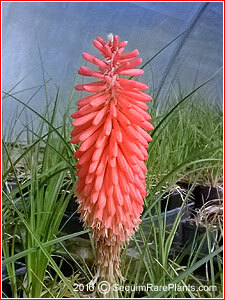 $8.95 Growing to 2½ - 3 feet tall, these flowers are orange-red with a slightly darker, dusky shading to the flowers at the upper portion of the flowerhead. K. x pfitzeri is named for the Pfitzer Nursery of Stuttgart, Germany where it originated. 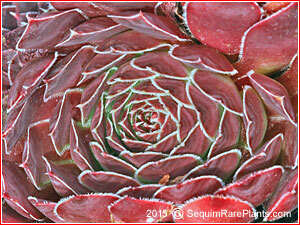 It can survive to USDA zone 5 (-15°F to -20°F). Be sure to plant it before summer is too far along so it has time to settle in before the seasons change, and cooler weather arrives. $14.95 Flowering in late summer with stems to three feet, it is a solid lemon yellow with just a hint of green. Our summers are generally cool, and whether we are having a slightly warmer or slightly cooler summer does change the coloring, with their color being a little darker in some years. Cold hardy in USDA zones 6 to 9, also to zone 10 in the West. And to Zone 5 when planted early enough in the summer to give it enough time to settle in and firmly establish itself before the end of the growing season. 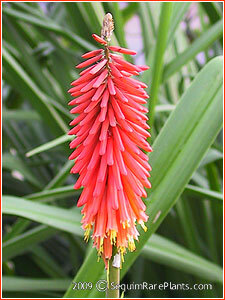 $12.95 Coral red flowers on stems of 2½ feet bloom in early summer. 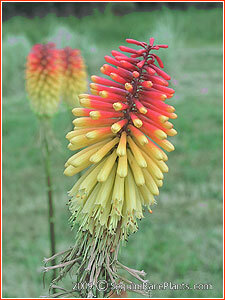 This is one of the hardier torch lilies. Although this variety has been around for several decades in America, it isn't frequently available. $9.95 With flowers showing in late summer to fall, this species, rooperi is tall at four feet with large flowerheads that are globe shaped. USDA zones 7 - 9, and to zone 10 in the West. 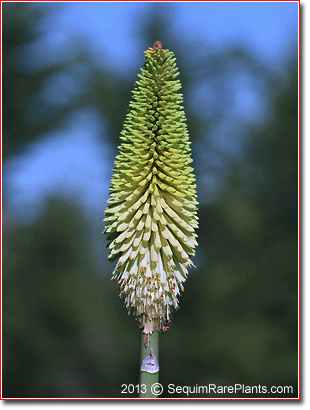 $9.95 If you were to find an old nursery catalog of several decades ago listing any Kniphofia, this variety could be among the ones named. It was available in America following WWII. We purchased it over twenty years ago from Carroll Gardens, a mail-order nursery that's now closed. 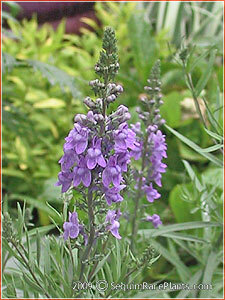 It is a robust plant and has rosey heads of flowers on stems of three to four feet, in July and August. USDA zones 5 - 8, and zones 9 and 10 in the West. $14.95 The colors of 'Royal Standard' are a lemon yellow with the top third of the torch in scarlet. Flowers appear in July and August on stems of three to four feet. Flowers with these rich and bright colors look especially good when the sky is overcast. USDA zones 6 - 10. $13.95 The flowers show in the middle of summer with narrow heads that are colored in medium orange/tangerine. The florets at the top of the spike are a bit darkly tinted. 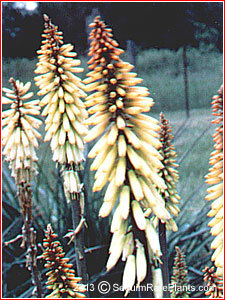 The older, open florets at the base of the spike are more golden. 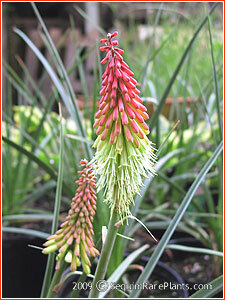 Brought to America by Urs Baltensperger of Edelweiss Perennials, this grows three to four feet tall. USDA zones 5 - 8, and zones 9 & 10 in the West. 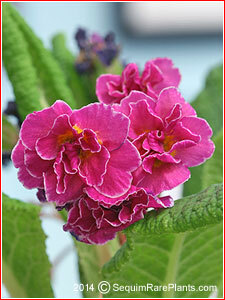 $12.95 Truly winter flowering, plants in the ground have survived well with temperatures down to +6°F. It is best grown where winters are mild, such as the Deep South or California. 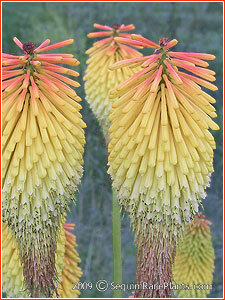 Plants spread by runners, which is characteristic of only a few torch lilies. 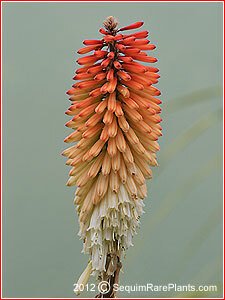 Its colors are coral-red turning to creamy yellow as they age, the overall shape of the flower spike tapering sharply at the top end. Height of the flowers is 18 to 24 inches. $14.95 This was offered by a nursery located in the Appalachian foothills of Virginia that we picked up about twenty years ago. It is a plant that can take a greater degree of winter cold. It blooms in late spring to early summer. 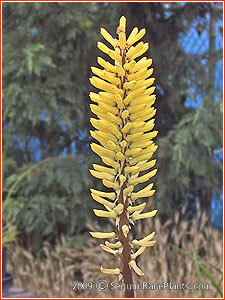 The flowers are orange-red and yellow, with a height of three to four feet. It grows robustly. USDA zones 6 to 10, and to zone 5 with a covering over winter. $10.95 It is curious how plants are named, this flowering in the middle of summer instead of spring. In July and August appear these in a coral red on the top half and light yellow, sometimes creamy white, on the lower half. One of the hardier kniphofias. Height is two and a half to three feet. USDA zones 5 - 9, and to zone 10 in the West. $10.95 This flowers in early summer and reaches a height of three feet or slightly more. 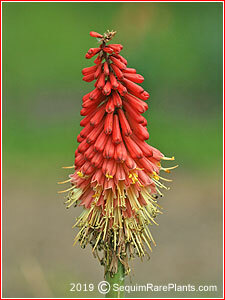 It flowers for about six weeks with some additional light flowering towards autumn. USDA zones 6 - 10. 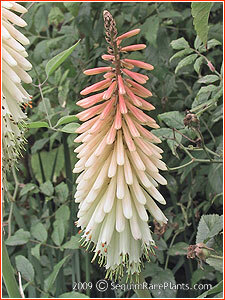 $9.95 The flower stems grow to five feet tall, with a slightly leaning curve that is characteristic of the plant. Plants will send up many flower stems, one after another for most of the summer. 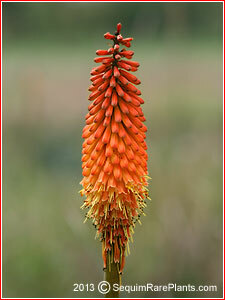 The individual flowers are widely spaced on the stems, of a soft but striking orange. USDA zones 7 - 10, and possibly zone 6. 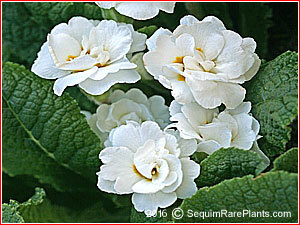 $12.95 The flowers of this are cream, darkening at the top a light toffe color. 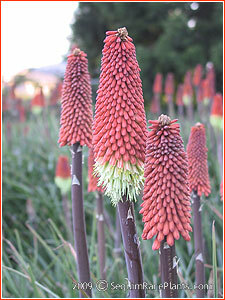 The flower spikes are lower than most red-hot pokers, reaching a height of two feet. Grows as a slowly widening clump, that in several years will become long-blooming, beginning in June or early July and continuing for most of the summer. USDA zones 7 - 10. It will survive in colder climates if you give it winter protection such as covering with a mulch or a large basket turned upside down and kept from blowing away, with a large rock on top during winter's cold. $14.95 The unusual characteristic of this light yellow flower is the way each single floret is held out horizontally from the flowerstalk. And as they age, the older florets continue to be held out horizontally, not lowering themselves as happens with the majority of other torch lilies. The plant's height is in the range of three feet. And its season of bloom is the later part of summer. USDA zones 7 - 9, and to zone 10 in the West. $12.95 Grown and named by Luther Burbank, this is a large flowered plant appearing near summer's end. Colors are a golden yellow with a light touch of range/red at the top. Its height is two and a half to three feet. USDA zones 7 - 9, and to zone 10 in the West. 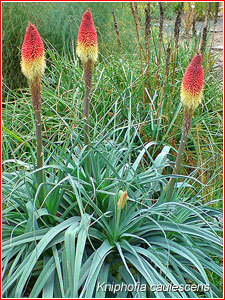 $14.95 This species of kniphofia is unique in several ways - its flowers are lightly fragrant; its tall narrow heads of brownish flowers bring to mind the long tubular, brownish flowerheads of cattails (Typha) as much as they do red-hot pokers; and it is one of the very last of torch lilies to bloom, waiting until September and October. Its leaves are also unique - they are straplike, twisting slightly, resembling the straplike leaves that you find on cattails. 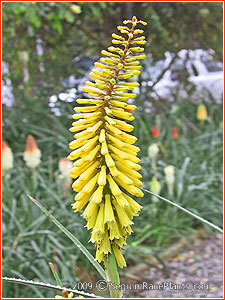 It is a plant that needs wetter ground to grow well -- several torch lilies are found in the wild growing on marshy ground. 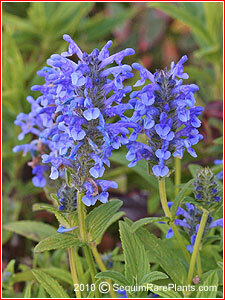 Seneca Hill Perennials reported that it survives well in their zone 6 garden, and blooms successfully for them. The height of the flower stems is four feet. $9.95 Long blooming and colorful with clear yellow flowers for most of summer, beginning in June or early July. Height of 2½ - 3 feet. Will survive in a dry landscape although it will grow better and flower more profusely with occasional watering during summer. USDA zones 6 to 9, and to zone 10 in the West. $17.95 Either 'Yellow Hammer' or 'Yellowhammer.' 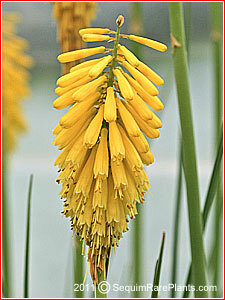 The flowers of this perennial are lemon yellow and start blooming in late May, earlier than most Kniphofias. 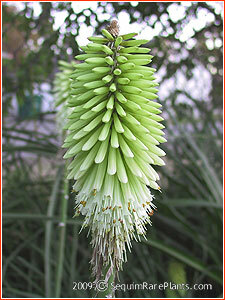 The flower's height is three to four feet. And it is not easy to find today. We don't know where the name of 'Yellow Hammer' originated. It's possible that it is named for a small, yellow-breasted bird native to Europe and Asia, commonly known as a yellowhammer, Emberiza citrinella. 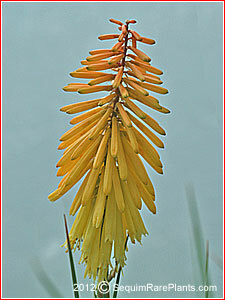 Some songbirds (in addition to hummingbirds) enjoy drinking the nectar from the flowers of torch lilies. This may be one of them. USDA zones 6 - 8 in the East, and zones 6 - 10 in the West. 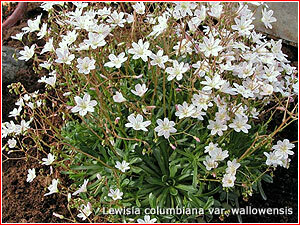 $7.95 A small scale lewisia, with short leaves and 6 to 8-inch high sprays of pure white flowers from spring to early summer. A choice rock garden plant. For USDA zones 4 - 8. Native to Oregon. $6.95 'Natalie' has masses of tiny lavender flowers for much of summer and is long lived. She is easily grown in average soil that is well drained, being drought tolerant once established and requiring no special attention. Her height is eighteen to thirty inches. The stems are very thin and her leaves are small. The overall appearance is lacey and delicate. Hardy to USDA zones 5 - 8. 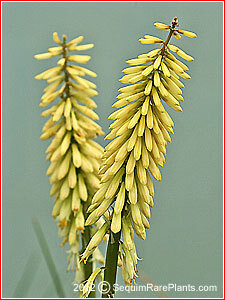 This plant is non-seeding, an advantage over other Linarias. 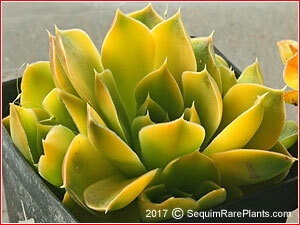 $9.95 deciduous agave -- A hybrid between Manfreda virginica and Manfreda maculosa (Texas tuberose), this plant has gray-green leaves speckled with sizable spots of reddish brown. 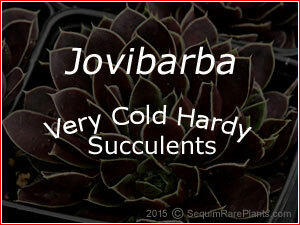 It is cold hardy USDA zone 5 (-20°F) when situated where the soil drains freely. Older plants, in time, will grow into a thick clump of shoots connected at their roots. The leaves grow to a height of 12 to 15 inches, with taller flower stems to 4 feet. 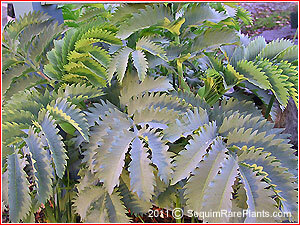 $10.95 This plant grows into a woody shrub about five feet in height, having large fingered, grayish or silvery leaves with a zig-zag pattern to the leaf margins as though they were cut with large pinking shears. Survives our winters although sometimes the stems are killed back in winter and must resprout from the roots. On warm summer days the rubbed leaves have a peanut butter-like scent. Flowers here in early summer with clusters of reddish stems and green blooms above the leaves. Cold hardy to USDA zones 7 - 11. Plants that survive in zones 7 and 8 may freeze to the ground, however will resprout from the roots in spring. If a young plant looks like it has frozen, do not be too quick to dig it out. You might discover signs of life and wish you hadn't disturbed it. $10.95 Clusters of small, white flowers appear on this groundcover in early spring before the new leaves appear. The leaves are more the show than the flowers. 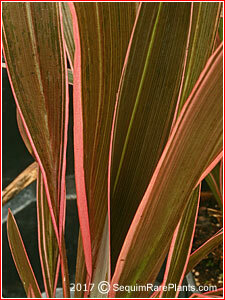 The shiny, fingered leaves are fan-shaped emerging a bronze-green, that in strong light turn to crimson at the edges. In fall, the green centers turn to gold. Height will be twelve inches on an established plant. This likes partial shade and evenly moist ground throughout summer, and grows better across the cooler, more northerly part of North America. It is a Japanese hybrid of a species that is native to China and Korea. With age the plant will spread out from thick rhizomes. Cold hardy to USDA zone 4. 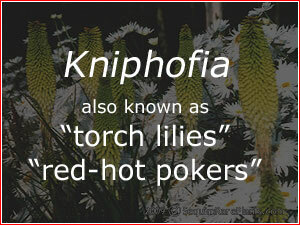 Also known as Aceriphyllum. $7.95 Growing to a size of ten inches tall, this bushy perennial flowers from June through August, bringing welcome color to the late summer garden. 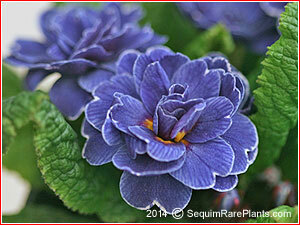 Its flowers are a rich violet-blue. Hardy to USDA zones 5 - 9, this species is native to Kashmir. It likes well-drained soil in sun. $8.95 Temporarily sold out, a fresh crop should be ready by May. 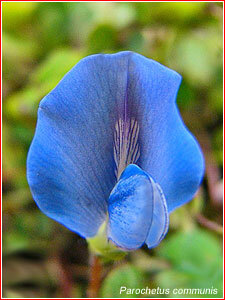 Known as both blue oxalis and shamrock pea, this is native to the mountains of Africa and Asia. 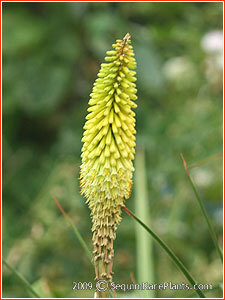 It is low at 1 to 3 inches tall and spreads widely to a couple of feet or more. 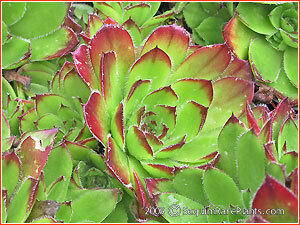 The green leaves often have a circle pattern of dark red. The cobalt blue flowers are unbelievable at first sight. Flowers are produced for a long season. 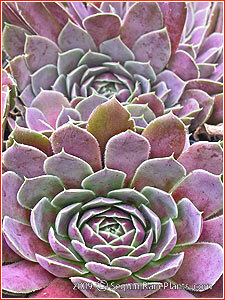 Plant it outdoors in the spring to give it a good start, and it will survive over winter to USDA zone 8b. $5.95 Pelargonium x fragrans 'Snowy Nutmeg' has green leaves irregularly splashed with cream that are gloriously scented. 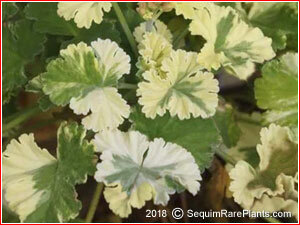 A small-scale scented-leaf geranium, its leaves are up to about an inch wide. It isn't reliably frost hardy, although it may survive outdoors in USDA zones 7 and 8 in a protected location such as under the eaves of a house. White flowers bloom thru summer. 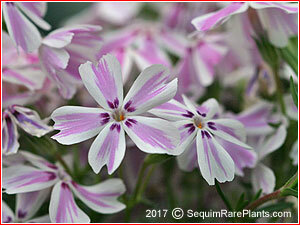 $7.95 Low and spreading, this is a form of a native phlox with leaves that are thin and evergreen. Masses of bicolored flowers of cream and pink come in mid spring. Older plants will bloom so heavily that the flowers can completely hide the foliage. A beautiful addition to a rock garden, or planted to drape down a slope or over a rock wall. Combines well with spring blulbs such as tulips and daffodils because of its low height. USDA zones 3 - 9. 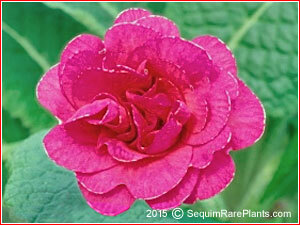 $9.95 This is native to New Zealand, with leaves of green edged in pink that are evergreen. 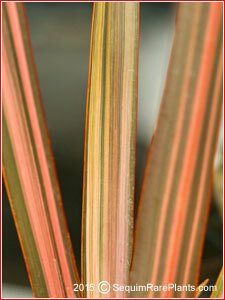 'Candy Stripe' reaches a height of three feet, making a good focal point in a garden. USDA zones 7 - 10. $9.95 Although this colorful form of New Zealand flax has been offered in America for about ten years, it isn't easy to find. The leaves are striped in light cream and various shades of tawny salmon. A mature plant will reach a height of three to four feet, with leaves two inches wide. Plant it in full sun to light shade. It can tolerate fairly dry conditions although it looks best with regular irrigation. Hardy to 15 - 20°F. $8.95 This has arching, upright leaves of maroon-brown. 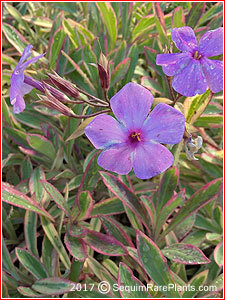 In full sun the color will be darker than when planted in a shadier spot. Its mature height is three to four feet. Grows quickly and looks better with regular, deep watering. Older plants can take more drought. Cold hardy to 15 to 20°F. $6.95 A dwarf plant, growing to a height of eighteen to twenty-four inches, 'Tom Thumb' has thinner, narrow leaves of green. The smaller scale of this dwarf makes it a nice addition near the front of a group of plants. USDA zones 8 - 10. $7.95 Not frequently offered at nurseries, the common name of this is horned rampion. It is a close relative of bellflowers, Campanula, although the flowers are quite different in appearance from bellflowers. Each flowerstem holds a ball-shaped cluster of violet-blue flowers, and long, spiky bracts, that have a light, dainty character. Its foliage is thin and grass-like. 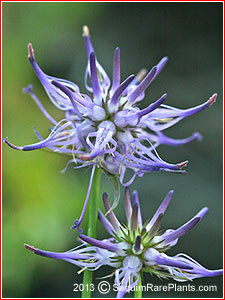 Horned rampion hails from the mountainous Alps of Europe. Hardy to USDA zones 6 to 9, and to zone 5 with protection. 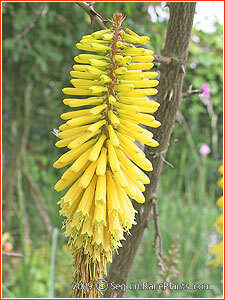 Its flowering season is early to mid summer, and blooms at a height of eight to ten inches. 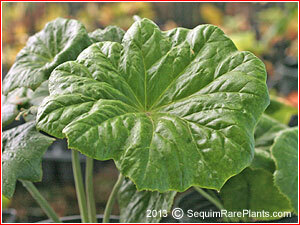 $14.95 The common name for this is Chinese mayapple. 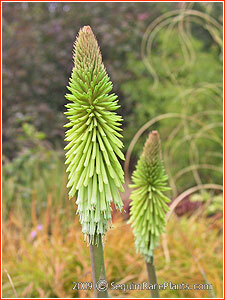 It has large, shiny rounded leaves from one to two feet tall. They may grow to the size of a large dinner plate and are very decorative. Richly dark red flowers bloom on the leaf-stems underneath the leaves. The flower buds do not open all at once, but one after another. An older plant will have many buds so that the flower season lasts for quite some time. This plant needs shade all day long to be happy, because direct sunlight will burn any part of the leaf that it touches. Hardy in USDA zones 6 - 8, and to zone 9 along the Pacific Coast. 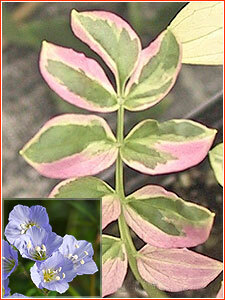 $8.95 (PP# 15,187) A variegated form of jacob's ladder that is native to North America, this has leaves of cream and green, sometimes with pink highlights. New fresh leaves continue to appear all season, keeping it attractive from spring to late fall. Afternoon shade is best where summers are hot. Height is 10 to 15 inches. Pastel baby-blue flowers open in mid to late spring. Hardy in USDA zones 4 - 8. 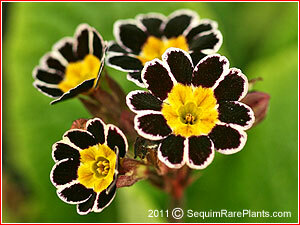 Primula auricula -- to go to a separate page offering them, click here. $5.95 The leaves are low and partially evergreen. The flowers begin to appear in early spring. For us they start in late February and continue on well into summer. When planted in just the right spot they can flower here year around. They would prefer a rich soil, light shade and slightly more moisture than average when they can get it, however will grow well in full sun and with less than perfect conditions. 'Blue Sapphire' has fully double flowers, two or three per stalk, of a rich blue that are often thinly rimmed in silver. Hardy in USDA zones 6 - 9, zone 5 with protection. $5.95 This fully double flower has petals of sunny yellow. The height of a plant will be six inches. It likes a humus-rich soil in partial shade. Withstanding winter cold to USDA zone 5 with protection, it will survive from year to year as a true perennial in regions where summers are not humid and hot. In other words this is more of an annual in the South. And the flowers are fragrant. 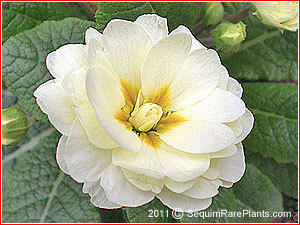 $5.95 This fully double primrose has petals of light cream. The height of a plant will be six inches. 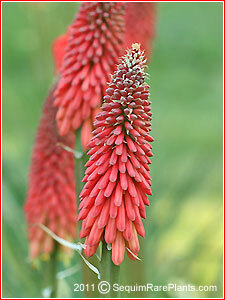 It likes a humus-rich soil in partial shade. Withstanding winter cold to USDA zone 5 with protection, it will survive from year to year as a true perennial in regions where summers are not humid and hot. In other words this is more of an annual in the South. The creamy flowers are fragrant, too ! 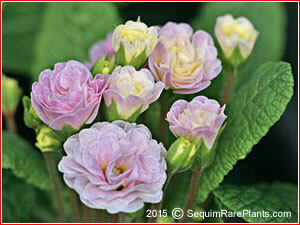 $5.95 A dark leaved primrose with creamy pink flowers, 'Drumcliff' is very cold tolerant, surviving to +5°F. Height of 4 to 6 inches. Both spring and autumn blooming. And even during winter in the South. $5.95 Lovely double fuschia-pink blossoms, flowering from March to May. She grows six to eight inches tall and six to ten inches wide. The person, Lilian Harvey (1906 - 1968), was a German-British actress and singer. Hardy in USDA zones 6 - 8, also to zone 5 with protection, and to zone 9 along the West Coast. 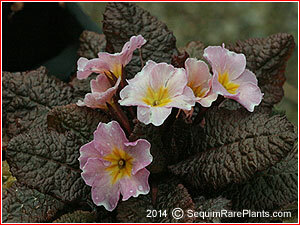 $5.95 This primrose starts out purple when it is in bud, and even as the flower opens it is still purplish. Only gradually does it turn to ruffled, double flowers of hot pink, a pink leaning towards violet, with a pencil-line edging of cream. 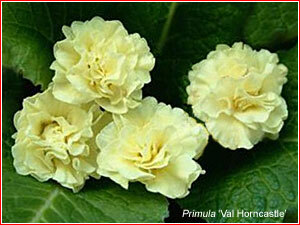 As with other primroses, 'Mark Viette' grows best in ground that is lightly moist, and in partial shade. Dividing plants of it every couple of years is recommended to keep the plants healthy and blooming well. Hardy in USDA zones 6 - 8, also to zone 5 with protection, and to coastal areas of zone 9. 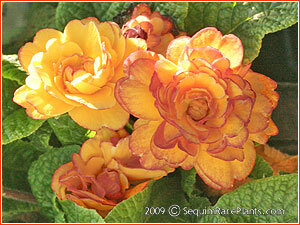 $5.95 'Nectarine' is a more unusual color in a double flower, a combination of light and darker yellow and orange. Hardy in USDA zones 6 - 9, zone 5 with protection. $5.95 Multicolored flowers of black with a wide white edging and golden eyes are showy and very bright. 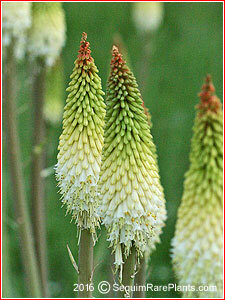 The flowers come in clusters atop four-inch stems in spring and again in fall. The leaves are light green and can be evergreen depending on the severity of the winter. USDA zones 6 to 9, to zone 5 with protection. With good snow cover it is routinely carried over winter in zones 3 and 4. $5.95 Cluster of ruffled, double pure-white flowers show in spring and again during the cooler days of autumn. USDA zones 6 - 8. Longer lived where summer weather is not hot and humid. $5.95 Light pink in a double flower. Blooms for many weeks in spring and again when cool weather arrives in autumn. Height of six inches. Hardy in USDA zones 6 - 8, also to zone 5 with protection (and to zone 9 near the coast along the Pacific Ocean). 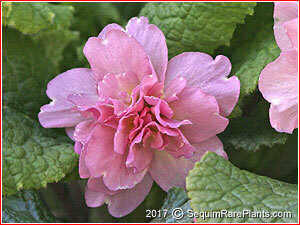 $5.95 Quaker's Bonnet is a very early bloomer, with clear mauve-purple flowers. We suggest dividing it every two or three years, in early fall. Also known as 'Lilacena Plena,' this old primrose was one of the original double varieties used by Florence Bellis in her breeding program. USDA zones 4 - 8, and to zone 9 on the West Coast. $5.95 Flowers of light, candy pink are double. As a flower ages, her petals lighten to a creamy pink. For growing conditions, dappled shade and damp but well-drained soil is recommended. 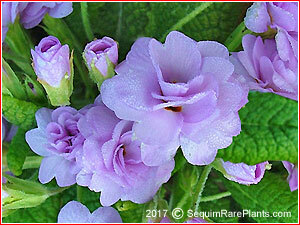 To encourage vigorous growth and prolific flowering, dividing the double primroses every year or two is best, and adding some compost or organic fertilizer to the soil. 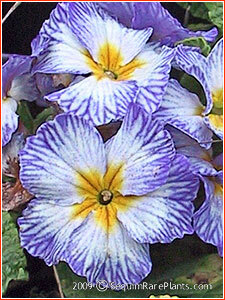 $7.95 With large blue and white flowers, the name of this primrose is appropriate for its unique look. 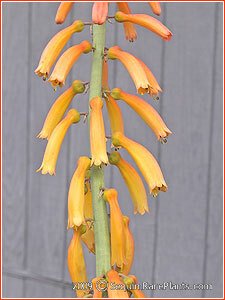 Four-inch high stems carry clusters of flowers in spring and again in autumn. The leaves are light green and can be evergreen depending on the severity of the winter. USDA zones 6 to 9, to zone 5 with protection, and even to zone 3. 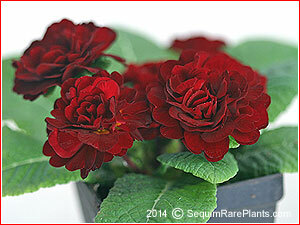 $5.95 The richly red color of this primrose brings to mind the red roses that are so popular for Valentine's Day. This double flower is a similar red. USDA zones 6 - 8, and zone 5 with protection. 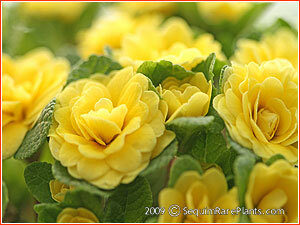 $5.95 These lovely double flowers are a soft and delicate shade of yellow, that bloom from late winter, well into spring. They are best grown where the soil does is somewhat moist and where the sunlight is not too strong. Dividing a plant every two to three years, in early fall, is recommended. USDA zones 4 - 8, and to zone 9 on the West Coast.